The myeloproliferative disorders (MPD) and myelodysplastic syndromes (MDS) encompass a pathologically and clinically heterogeneous group of hematologic entities that are united by their putative origin from pluripotent hematopoietic stem cells. The World Health Organization classifies these entities into three broad categories: (1) the chronic myeloproliferative diseases, (2) the myelodysplastic syndromes, and (3) the myelodysplastic/myeloproliferative diseases1 (see Table 35-1). Though all are true hematopoietic stem cell disorders characteristically associated with bone marrow hyperplasia, they are divergent in that MPD typically are associated with effective hematopoiesis,while MDS are associated with ineffective hematopoiesis, reflected by high or low peripheral blood counts, respectively. Of the 17 discrete diseases currently recognized, the molecular pathogenesis of chronic myelogenous leukemia (CML) is best understood and ultimately has resulted in the development and application of targeted molecular therapy. As a result, molecular techniques play an integral and well-established role in the diagnosis of CML, in the determination of therapeutic response and efficacy, and in the detection of minimal residual disease. Consequently, most of this chapter focuses on the role of molecular pathology in the laboratory assessment of CML. However, the molecular pathogenesis of some of the other MPDs has recently been elucidated, with the potential for the development of clinically useful molecular tests. By contrast, the molecular underpinnings of MDS have not yet been as well delineated; nonetheless, molecular pathology testing has emerging utility in the diagnosis and assessment of these disorders and also is discussed briefly. CML comprises ~20% of all leukemias and is diagnosed at a median age of approximately 50 years. The disease originates from the transformation of a hematopoietic stem cell with resultant expanding myelopoiesis that characteristically evolves through three phases when untreated: (1) a chronic phase of 4 to 5 years' duration manifest by myeloid hyperplasia with circulating granulocytes that are present in all stages of maturation; (2) an accelerated phase of shorter duration during which myeloid elements begin to lose the ability to differentiate; and (3) inevitably, a blast phase of acute leukemia of myeloid (70%) or lymphoid (30%) phenotype. The reciprocal t(9;22)(q34;q11) translocation is identified as the initial transforming event in the development of CML, although some data suggest that it may be preceded by clonal hematopoiesis. The translocation yields a shortened chromosome 22 called the Philadelphia chromosome (Ph)2 (Figure 35-1). With the translocation, two distinct genes are fused: (1) BCR that encodes a cytoplas-mic protein of uncertain function but with oligomeriza-tion, serine-threonine kinase, and GTPase-activating domains, and (2) ABL1 that encodes a nonreceptor tyrosine kinase normally localized to the nucleus.3 The resultant chimeric gene and fusion transcript yield a fusion protein with constitutively increased tyrosine kinase activity that is relocated from the nucleus to the cytoplasm and phosphorylates a variety of cellular substrates. The result is growth factor-independent proliferation, decreased apoptosis, and defective adhesion in the transformed cells. The t(9;22) translocation can involve several different breakpoints in the BCR and ABL1 genes, resulting in different chimeric fusion proteins that confer somewhat specific clinicopathologic features and highlight the fact that this translocation is not pathognomonic for CML4 (Figure 35-2). These breakpoints are indistinguishable by traditional karyotyping and can be differentiated only using molecular techniques. For all fusions, most of ABL1 is juxtaposed to variable 5' portions of BCR. Whereas the breakpoint involving ABL1 is relatively conserved, usually arising in the intron before exon 2 (a2), the breakpoints involving BCR are more variable. Overall, the presence of t(9;22) is quite common in adult patients with ALL (~25% ALL) but relatively less common in pediatric patients (~5% ALL). Infrequently, an extreme 3' breakpoint occurs beyond exon 19 (e19) of BCR in the designated micro region (|i-bcr), resulting in a larger (p230) fusion protein characteristically associated with neutrophilic CML, in which mature granulocytes predominate, as well as in chronic neutrophilic leukemia (CNL), although recent data indicate a less well-substantiated association with the latter.6,7 The Philadelphia chromosome also has been detected in rare cases of de novo acute myeloblastic leukemia and T-cell ALL. Figure 35-1. Schematic representation of the reciprocal t(9;22)(q34;q11) translocation with the disruption and fusion of ABL1 from the long arm of chromosome 9 with BCR on the long arm of chromosome 22. 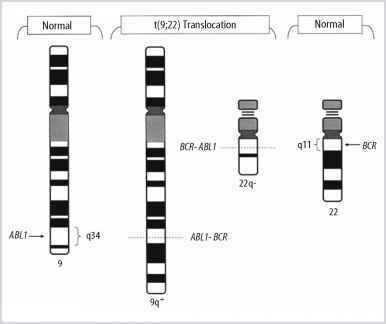 The resultant 22q- is the Philadelphia chromosome and contains the BCR-ABL1 fusion gene, while chromosome 9q+ contains the reciprocal ABL1-BCR fusion gene that apparently lacks biologic function, but which is expressed in approximately 60% of patients with CML. Figure 35-2. Schematic representation of (a) the BCR and ABU genes demonstrating the primary breakpoint cluster regions (bcr), (b) the RNA/cDNA structure of the most common chimeric transcripts and the primers used for their RT-PCR amplification,and (c) the resultant oncoproteins with their specific clinicopathologic correlates. See text for details. The association of the p230 with CNL has been questioned,with this being more a feature of "neutrophilic CML." ALL,acute lymphoblastic leukemia; CML, chronic myelogenous leukemia; CNL, chronic neutrophilic leukemia. (Modified,with permission,from Vergilio JA and Bagg A. Chronic myeloid leukaemia—Molecular diagnosis and monitoring. In: Encyclopedia of Medical Genomics and Proteomics (EMGP). Jürgen Fuchs and Maurizio Podda, (eds.) Marcel Dekker 2005:252-258 and Bagg A. Chronic myeloid leukemia: A minimalistic veiw of post-therapeutic monitoring. 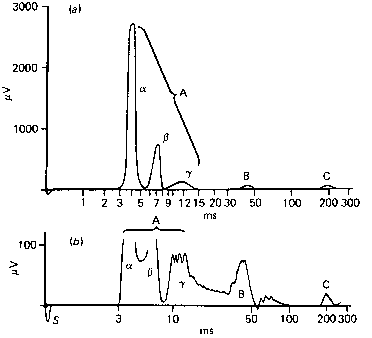 Journal of Molecular Diagnosis 2002;4:1-10.